Wells Fargo just reported the worst mortgage number since 2008, there mortgage origination business has been declining for many years. IMF chief says the debt level for many countries is way to high. Trump nominees deserve a fair hearing, but the [CB][DS][MSM] are against this. The independence of the [CB] is under constant threat and it is getting worse, the MSM reports. Trump is gearing up for a financial war against the [CB], this has been done twice before and the people won. Rs and Ds are both cheering that Assange was arrested, these people have a lot to lose if he spills the evidence. [RR] defends Barr. Trump tweets out that Obama’s White House attorney has been indicted and this is a big deal, and is the beginning. Trump trolls the MSM and the D’s on immigration. Man lights himself on fire in front the WH. Message sent and received. Please check Newzsentinel.com for the latest news on the economic collapse. The Sentinel Alerts are updated throughout the day. If you haven’t already, go to “The People” and join the community of people who are helping each through the economic collapse. 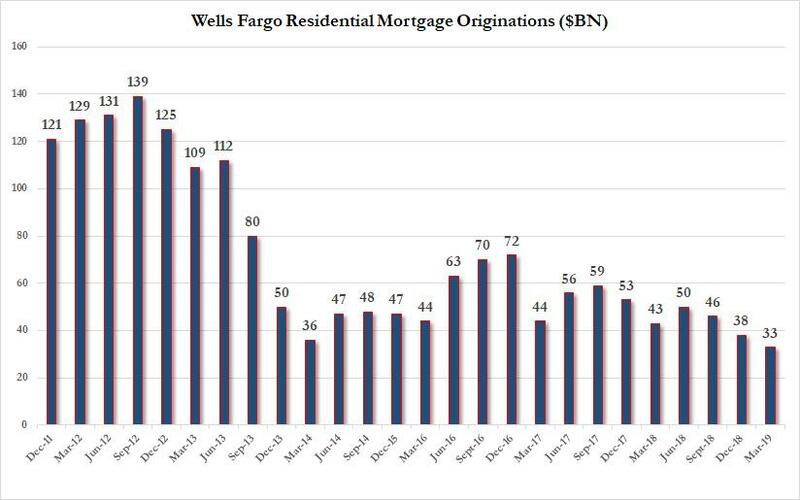 Wells just reported that its ‘bread and butter’ is once again missing, and in Q1 2019 the amount of all-important Wells Fargo Mortgage originations shrank again, dropping to just $33 billion, down $5 billion sequentially, and the lowest level since the financial crisis. Putting this number in context, just six years ago, when the US housing market was actually solid, Wells was originating 4 times as many mortgages, or about $120 billion. With global growth slowing and many countries struggling with high debts, now is not the time for the “self-inflicted” economic wound of trade wars, the head of the International Monetary Fund is warning. there is growing optimism that the Washington and Beijing will settle their trade differences. In fact, China said Thursday that talks are “moving forward” after nine rounds of negotiations. No, it’s not ridiculous for President Trump to consider nominating Herman Cain to the U.S. Federal Reserve Board. Cain has relevant experience and good ideas. A Washington Post op-ed calls Cain’s potential nomination a “reckless” move. Criticism of Cain can be summarized into three main points. A native of Atlanta, Georgia, Cain was born into a poor family. His mother worked as a maid and his father was once a chauffeur. From this humble background, Cain went to college, got a master’s degree in computer science from Purdue University, and worked his way up from analyst to chief executive in corporate America. One of his business accomplishments was the turnaround of the Godfather’s Pizza chain in 14 months when he was its president and CEO. But there is more. In 1992, Cain became one of the board of directors for the Federal Reserve Bank of Kansas City and was the board’s chairman from 1995 to 1996. Many Americans are not familiar with gold standard today, so it is easier for political pundits and even some economists to dismiss the gold standard as a fringe idea. But in 1800s, almost all the nations in the world adopted the gold standard, which “guaranteed that the government would redeem any amount of paper money for its value in gold.” The beauty of the gold standard is that because there is a limited supply of gold, it serves as a natural constraint on government spending and inflation. The argument the [DS] is making is that Cain, and Moore, become Federal Reserve Board members, they would ruin the “independence“ of the Fed because they are both Trump loyalists who would politicize future monetary decisions. Coming out of the economist, they have an article titled the independence of central banks is under threat from politics.
. In the 1970s it was normal for politicians to manipulate interest rates to boost their own popularity. That led to a plague of inflation. And so rich countries and many poorer ones shifted to a system in which politicians set a broad goal—steady prices—and left independent central bankers to realise it. In a single generation billions of people around the world have grown used to low and stable inflation and to the idea that the interest rates on their bank deposits and mortgages are under control. Today this success is threatened by a confluence of populism, nationalism and economic forces that are making monetary policy political again. President Donald Trump has demanded that interest rates should be slashed, Brexiteers rubbish the competence and motives of the Bank of England, while in Turkey President Recep Tayyip Erdogan has been in a tug-of-war with the central bank. India’s government has replaced a capable central-bank chief with a pliant insider who has cut rates ahead of an election. dangerous forces are afoot that could have alarming consequences for economic stability. Like Andrew Jackson before him, Trump is preparing to go to war with America’s central bank. Donald Trump installed a portrait of Andrew Jackson on the Oval Office. Add this: Andrew Jackson fought a bitter battle with his cabinet, fired two Treasury secretaries, and mounted a campaign against the Bank of the United States. Nicholas Biddle—president of the Bank of the United States resisted Jackson—and the Bank War followed. Biddle was allied with Henry Clay and when Jackson beat Clay in the 1832 election, he took it as a mandate to get rid of the Bank. Which he eventually succeeded in doing. The nation remained without a central bank from 1836 until Woodrow Wilson established the Federal Reserve System on December 22, 1913. Serious observers and policy makers believe that Trump’s war on the Fed is designed to set the tone for a full assault after the 2020 election. They believe he knows that neither Moore nor Cain can be confirmed, but wants to set up a battle that will arouse his base against the Fed. “I think it is clear from the indictment that came out it’s not about punishing journalism, it is about assisting the hacking of a military computer to steal information from the United States government, and look, I’ll wait and see what happens with the charges and how it proceeds, but he skipped bail in the UK,” Clinton saiid. Assuming he is successfully extradited Julian Assange will stand trial in a courtroom in Alexandria, Virginia where prosecutors from the Eastern District of Virginia will try to prove that he broke US law by goading Chelsea Manning into turning over hundreds of thousands of classified documents. Remember there is only one charge had been levied against Assange: conspiracy to hack a government computer. If convicted, he could face a maximum of five and a half years in prison. In the Assange indictment, prosecutors claimed that after Manning had already handed over hundreds of thousands of documents to Wikileaks, Assange tried to help the former Army private and intelligence analyst crack a password that would have allowed her to access hundreds of thousands of documents. However, Assange never succeeded in cracking the password, at least not as far as prosecutors are aware. What he did allegedly do was conspire with Manning to transmit the documents she had succeeded in stealing, while – and this is key – encouraging Manning to turn over more documents when she expressed reluctance. To support its case, the government has obtained chat logs from March 2010 showing Manning communicating with a mysterious individual who alternatively went by the handles “Ox” and “pressassociation”. The government believes this user was Assange. After transmitting hundreds of thousands of war logs from Iraq and Afghanistan and detainee assessment briefs from Guantanamo Bay, Manning said her stash of secret documents had run dry. The indictment also references a claim made by Manning during her court martial statement that she had discussed the value of the Guantanamo detainee assessments with the person alleged to be Assange. As for how they intend to conclusively prove that Assange was the individual who corresponded with Manning on the Jabber chat service they were using…well…that hasn’t yet been revealed. The indictment that the Justice Department filed against Julian Assange in the Eastern District of Virginia charges him with a conspiracy to commit computer fraud. The conspiracy statute is Section 371 of the penal code, and the computer fraud offenses that were the objectives of the conspiracy are parts of Section 1030. According to the indictment, Assange and Manning (then known as Bradley, now as Chelsea) conspired in 2010. Manning was prosecuted by the armed forces. 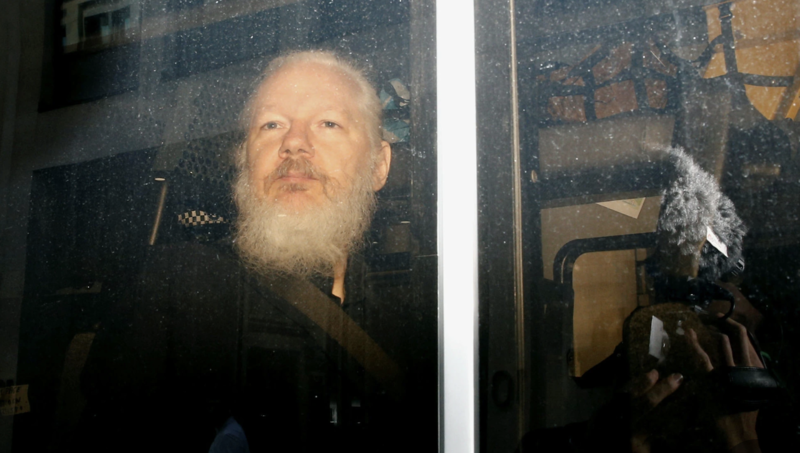 The Justice Department’s indictment against Assange was not returned until 2018 — eight years later. The five-year statute of limitations that applies to most federal crimes is prescribed for both conspiracy and computer fraud. So how is the Justice Department able to prosecute Assange on an indictment filed three years after the prescribed limitations period? It appears that the Justice Department is relying on an exception, in Section 2332b of the penal code, that extends the statute of limitations to eight years for “acts of terrorism transcending national boundaries.”Now, conspiracy to commit computer fraud is a very serious offense, and Assange’s is at the top of the seriousness range because it involved publication of defense secrets that endangered lives, including the lives of our troops. And there’s no doubt that the conspiracy transcended national boundaries — Assange was outside the U.S. when he collaborated with Manning. But is it really an act of terrorism? And was it him? How did @Snowden clear customs/immigration in HK AFTER the public release? Why wouldn’t he FIRST travel to final destination prior to public release? If wanted by the US govt would he be cleared to travel? Who provided support to escape? Who was the US after during this time? JA – have you learned & eliminated L-6? When did No Name travel to the UK? What if the UK gov worked hand-in-hand w/ the Hussein admin to sabotage the 2016 election? Creation of fake intel dossier using ex spy. Co-sponsor insurance policy re: POTUS election. What if intel masked penetration(s) to frame Russia? Why does the UK gov desperately want JA? Congressman Matt Gaetz (R-FL) introduced a bill dubbed the “PENCIL Act” to remove Adam Schiff (D-CA) from the House Intel Committee. Rep. Adam Schiff simply cannot be trusted with classified or sensitive information. Leaker and liar Adam Schiff should be thrown off of the House Intel Committee and his security clearance should be revoked after he peddled Russian collusion conspiracy theories for over two years without any evidence to back up his claims. Schiff also leaked portions of Donald Trump Jr.’s testimony to the House Intel Committee to fake news CNN. Schiff was seen leaving the closed-door House Intel hearing many times while Don Jr. was testifying and CNN would coincidentally publish articles about the contents of the hearing in real time. Why didn’t POTUS fire [RR] after reporting re: offer to wear wire? Why did WHITAKER/BARR retain [RR] to the END? Who signed off on the MUELLER summary report submitted by BARR yesterday? Who signed fraudulent FISA warrants? WHO APPOINTED MUELLER AS SPECIAL COUNSEL? Outgoing Deputy Attorney General Rod Rosenstein on Thursday defended Attorney General William Barr against allegations that he is misleading Congress and the public about the special counsel’s Russia report. “Democrats don’t like the results of the Mueller Report, so now they’re trying everything else.” @RepDougCollins They should stop wasting time and money and get back to real legislating, especially on the Border! President Barack Obama, speaking in private this week, extolled what he said was the drama-free nature of his White House and said it was a “low bar” now to avoid embarrassing presidential scandals. Former White House counsel for Barack Obama, attorney Gregory Craig, was indicted on Thursday by a grand jury in Washington for lying to the FBI and failing to register as a foreign agent. He is in trouble for failing to register as an agent fo Ukraine… and it is likely he also has tax problems with this because that is common with such cases. Naturally, Barack Obama is claiming he knew nothing about it. President Obama’s top White House lawyer, Gregory B. Craig, was indicted yesterday on very serious charges. This is a really big story, but the Fake News New York Times didn’t even put it on page one, rather page 16. @washingtonpost not much better, “tiny” page one. Corrupt News! 4. Barr releases summary, Mueller shows no Obstruction or collusion, DS goes crazy, media goes crazy, we want the full report, RR appointed Mueller, he controlled Mueller because sesssion recused himself. 6. Barr was asked if Trump was spied on, Barr says yes, didn’t give evidence because they want the DS to ask for it. Lets go to the border, Trump is now trolling those who support illegal immigration and sanctuary cities. Translation; Bernie Sanders just said he’s opposed to open borders which would cause an influx of migrants, so Pelosi – who has vehemently opposed every Trump border security policy since day one – now wants to appear as if she cares about stopping unchecked migration. Even the Democrats now say that our Southern Border is a Crisis and a National Emergency. Hopefully, we will not be getting any more BAD (outrageous) court decisions! Due to the fact that Democrats are unwilling to change our very dangerous immigration laws, we are indeed, as reported, giving strong considerations to placing Illegal Immigrants in Sanctuary Cities only…. ….The Radical Left always seems to have an Open Borders, Open Arms policy – so this should make them very happy! Why Are Democrats Upset at Illegal Aliens Being Sent to Their Sanctuary Cities? A story broke yesterday in which the White House apparently discussed sending illegal aliens to sanctuary cities twice in the last six months. This was described as Trump “targeting political foes” by The Washington Post. White House officials have tried to pressure U.S. immigration authorities to release detainees onto the streets of “sanctuary cities” to retaliate against President Trump’s political adversaries, according to Department of Homeland Security officials and email messages reviewed by The Washington Post. Here’s the response from Nancy Pelosi. Pelosi’s office blasted the plan. Adam Schiff took a break from whatever cable news hit he was doing at the time and posted this. Why would any Democrat oppose this? Why would MSM be outraged over this? Why wouldn’t they be fully supportive of sending illegals in need of sanctuary to their own self-described sanctuary cities? We’ve been told for years by these people that illegal immigrants are a net positive. They supposedly commit less crime (they don’t), do the jobs Americans won’t do, and provide valued diversity. The Democratic party believes that so much that they refuse to do anything to stem the tide. The media believes it so much that they run cover 24 hours a day for lax immigration efforts. Given that, how is it consistent to now complain that the President wanted to send them exactly what they claim they want? I also think it’s silly for The Washington Post to describe this as “targeting foes,” as Democrats constantly proclaim illegal immigration is a general good. If I give you a something you say is good, no one would say I’m “targeting” you. Why the complaint, These elitists don’t actually want their cities becoming home to masses of illegal immigrants. They want to sit in their gated communities hundreds (but mostly thousands) of miles away from the border and virtue signal instead. When push comes to shove though, they’d rather these people file into border towns in Arizona and Texas. They don’t want them in New York or San Francisco. In one of the biggest leadership shake-ups in years, North Korea named a new nominal head of state and a new premier, and gave leader Kim Jong Un a new title, state media reported on Friday, moves analysts said solidify Kim’s grip on power. LNA forces after reportedly taking control over the Brigade N*42 base in Ain Zara, southern Tripoli. Secret Service was quick to respond to the emergency situation. A man attempted to set himself on fire outside the White House this afternoon, causing the facility to immediately enter a state of lock down, according to reports from the scene. Video shows Secret Service escorting a man away from the White House after apprehending him moments after he attempted to self immolate. Reports indicate paramedics are currently attempting to provide emergency treatment to the man as he is rushed to a hospital. Thus far, there is no word on the man’s medical condition. The video, posted to Twitter by Mark Irons, shows the event happened around 3 p.m., and it shows the man being taken away by multiple Secret Service agents. Reports indicate the Secret Service was quick to respond to the emergency situation. A demonstration was made today in front of the WH. It showed they can control ‘innocents’. It was a direct THREAT. This is not a game. The MSM is creating emotional conflict. This destabilizes certain minds to become suspectable to outside control. What you SEE is 2%. Watch the news this week.